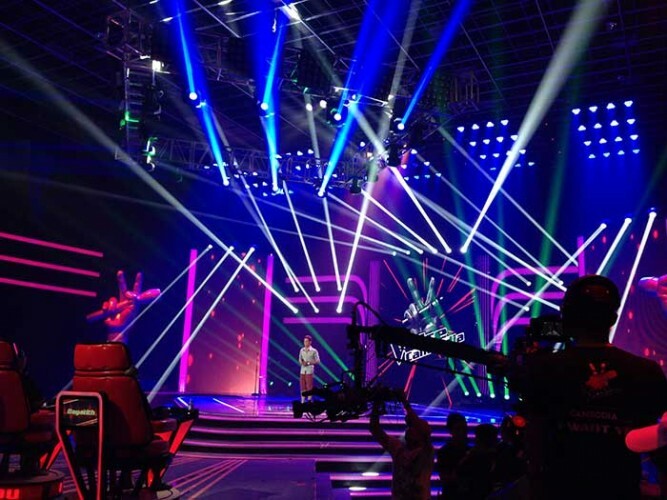 Hang Meas HDTV in Cambodia has been using PR Lighting fixtures extensively to highlight artists appearing on their new hit talent show, The Voice Cambodia. According to director and show producer, Oeng Sokly, this is the first series of the popular global programme to screen in the country, Hang Meas HDTV having purchased the licence from Talpa Global. Viewers tune in every Sunday to see who is voted through, while the show itself is in HMHDTV Studio at 4th floor, Aeon Mall, Phnom Penh — the first and biggest mall in Cambodia. 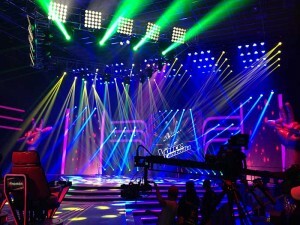 As the first high definition TV station in the country, the station has been a regular user of PR Lighting’s catalogue, having featured their fixtures on other live entertainment programmes such as Dream Palace, Teen Zone, Water Music, and Special Concert after sourcing the pieces from Phnom Penh-based LP Pro Stage, Light & Sound. 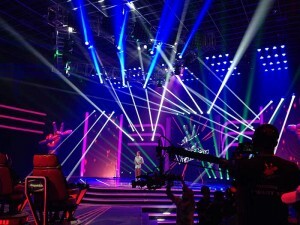 Oeng Sokly, who also co-designed the light show with Mr. Meng, uses around 100 XR300 Beam in the Voice set, supported by quantities of PR Lighting’s XL700 and XL Beam 300 discharge lights. “I particularly like the XR300 Beam because the fixture is stable and provides a good effect,” he said, adding that the saturated colours read beautifully to camera. In fact the XR300 Beam is a perfect solution for television shows where silent running and a super concentrated powerful parallel beam are required. Housing the Philips MSD Platinum 15R lamp, it is compact, fully featured and easy to install. 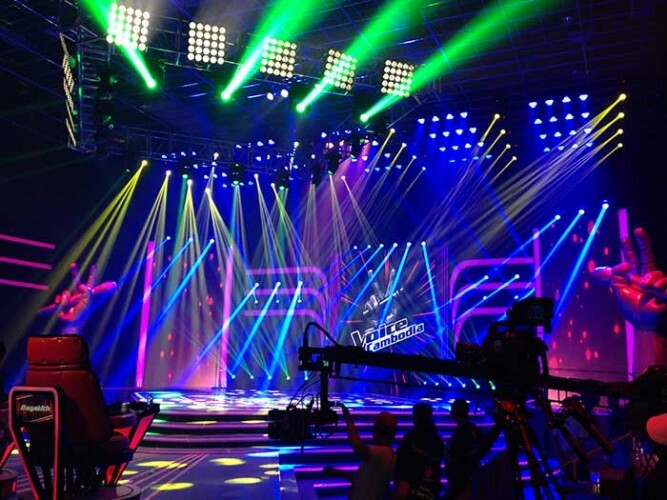 The Voice Cambodia lightshow is run from an Avolites Pearl Expert Pro, and the simplicity of programming of the PR Lighting fixtures enables cue stacks to easily be created so that all contestants have their own colour palette and individual personality.